We are blessed with sunshine here in Central Florida for a large portion of the year. This means that there are a huge number of homes that include a swimming pool to enjoy during our almost year-round warm weather. 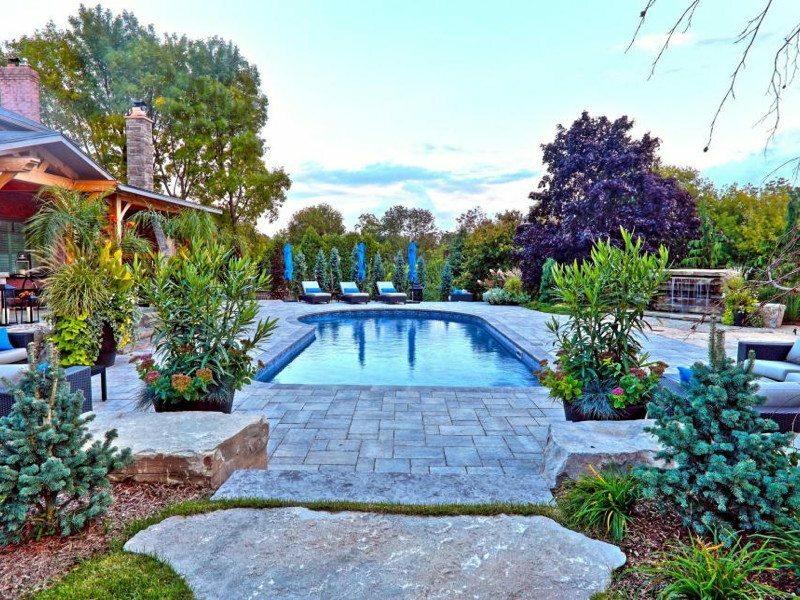 Whether you have an in-ground, above ground, open or screened pool, or even just planning on installing a new one, pool landscaping ideas are sure to be one of the topics that will be a high priority to make your pool area inviting and enjoyable. There are quite a few things to consider when planning or redesigning your pool area landscaping. Let us help you to be informed and pick the best plants from your Orlando landscape supply that will give you the look and feel you want to surround your pool. What other elements will be involved? Structures such as patios, decks, gazebos or outdoor kitchens will need to be taken into account when making your overall pool landscaping design. 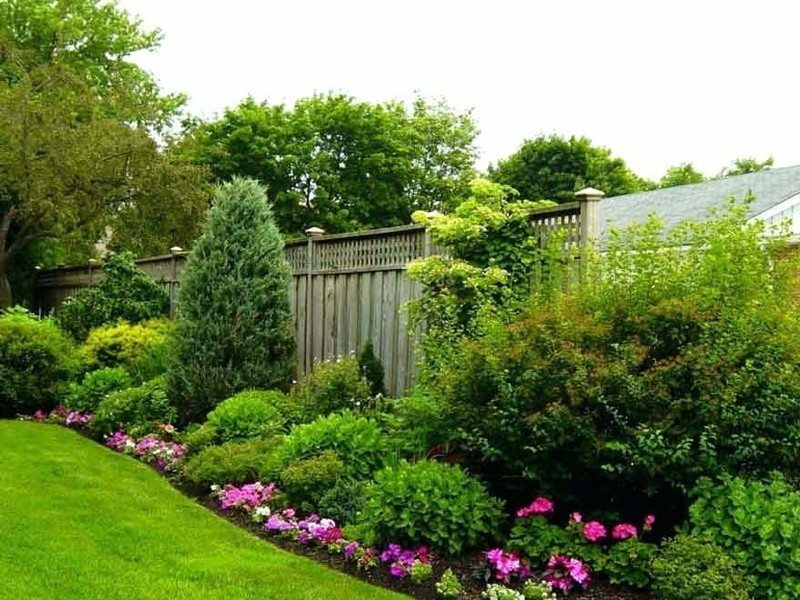 Some people prefer to use plants to create a natural privacy screen or fencing. You can soften up a pool deck area by installing pavers separated by grass. Keep these in mind. Pool areas can get humid fast. Depending on if your pool is full sun, shade or screened will also determine the amount of direct intense sunlight that can be extremely damaging to plants. Be sure to keep in mind the environment created around your specific pool and its features. 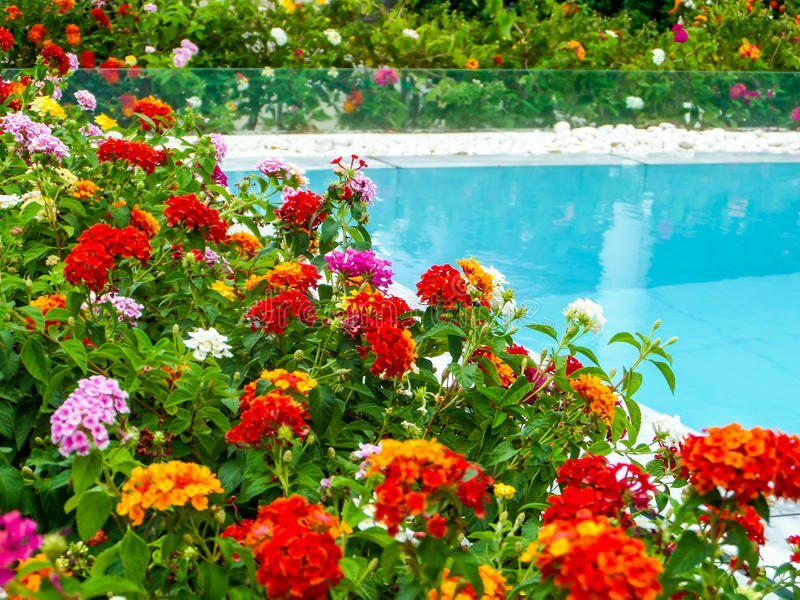 Chlorine and other chemicals can be splashed onto plants in and around your pool area. Be sure to choose hearty plants. Determine the look you are trying to achieve. Decide on tropical, desert or whatever design style you like before beginning to pick plants and be sure to pick a variety that will complement your own style. Stay away from falling leaves. This means avoid deciduous tress or those that lose their leaves and stick with evergreen or those that don’t create too much debris. You don’t want to spend your time scooping all that they shed out of your pool water. This can also cause changes in your pool chemistry and require the use of more chemicals. 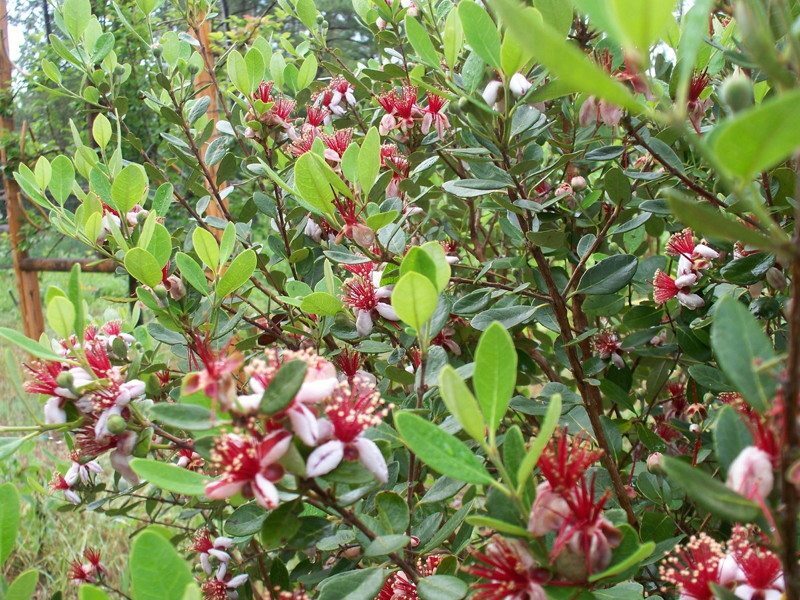 Flowering plants tend to attract bees. Keep this in mind when choosing plants and consider using flowering plants further away from where you will be hanging out near the pool. They can offer color and scent from a safe distance. First of all be aware that some of the plants listed here that thrive in pool areas can be equipped with thorns. They are beautiful and can be a great addition, just be sure to place them away from areas of high traffic to avoid injury to you or your guests. Also, growing a mix of flowering plants and foliage plants is a good way to reduce maintenance. Some of the plants below we recommend as features to any pool landscaping. Be sure to buy local from and Orlando landscape supply! Lantana is a good option that can withstand the heat. Your pool will reflect light and the areas around it will hot. Lantana is a tough and low maintenance plant that can tolerate it all. While some flowers may drift into the pool, they are overall pretty clean. These water loving plants can grow in bogs and shallow ponds and can be a great addition to your pool landscape where all the water gets splashed. They will love it. 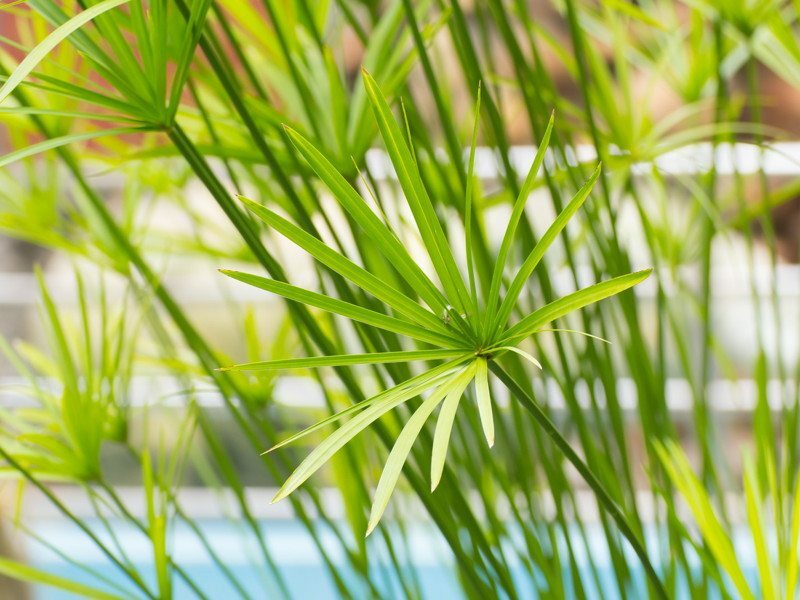 You can create an exotic and tropical oasis around your pool by incorporating these into the landscape. This stunning plant is perfect for around the pool. 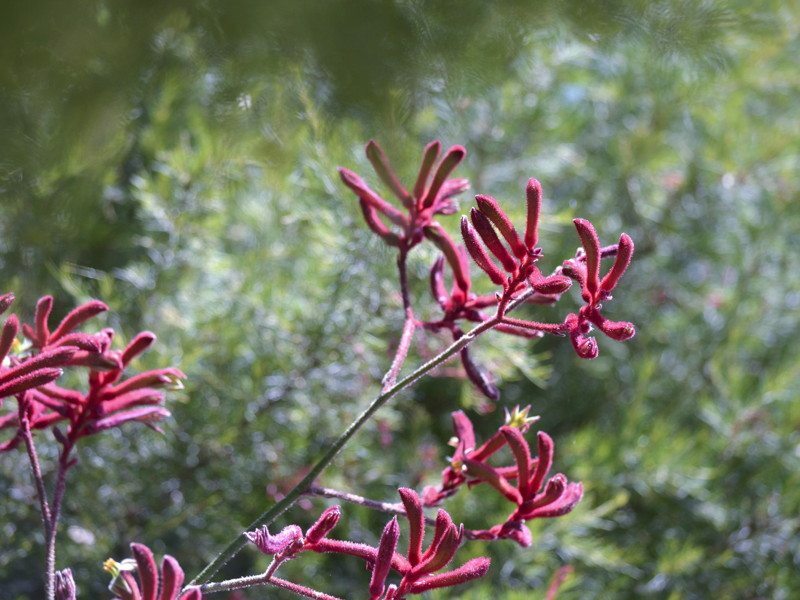 They are drought tolerant, can take the sun and come in a variety of amazing colors. This one will certainly be a head turner. These plants will immediately make your pool area a tropical escape. They quickly grow very tall with leaves growing up to 5-10 feet long. These will need to be planted near a wall or fence as those large leaves are fragile and can be easily ripped and tattered by winds. 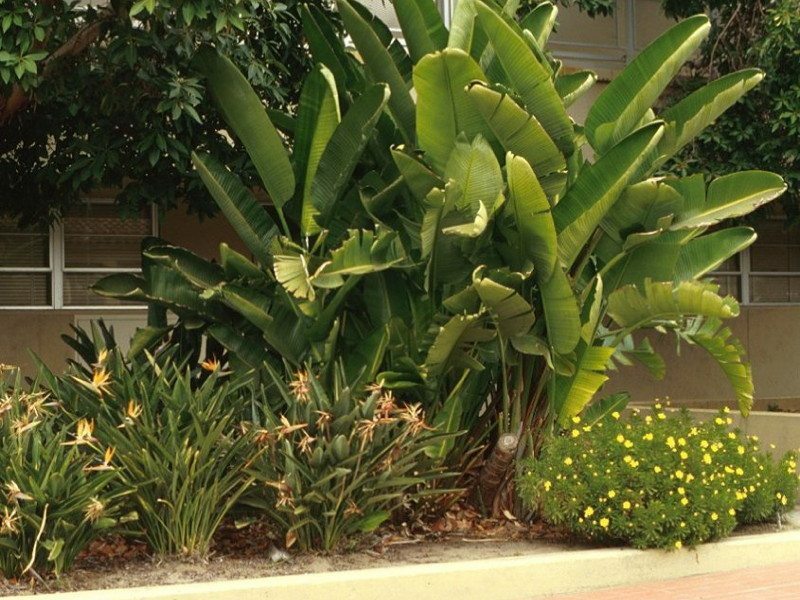 This picture shows a large Giant Bird of Paradise planted with small Bird of Paradise plants. This creates a great focal point and the smaller plants have vibrant colors to add to the design. 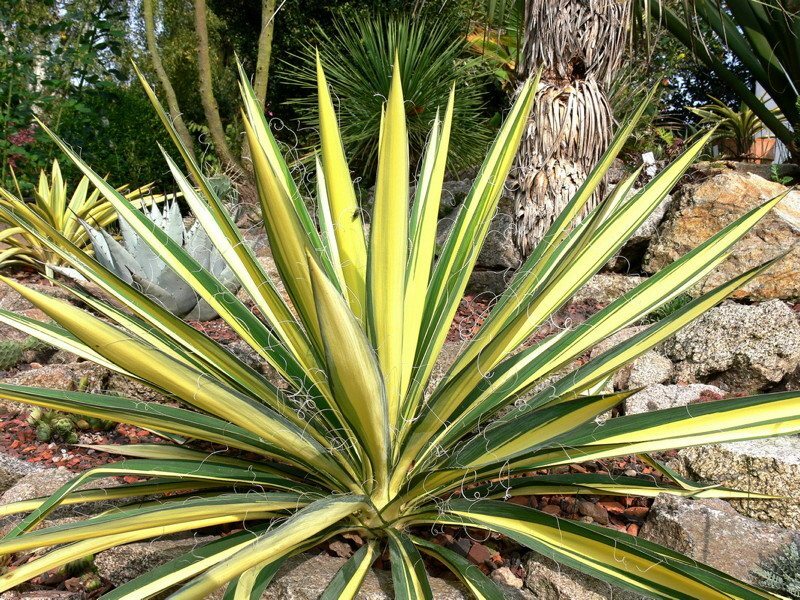 The Yucca plant is another perfect pool area plants. 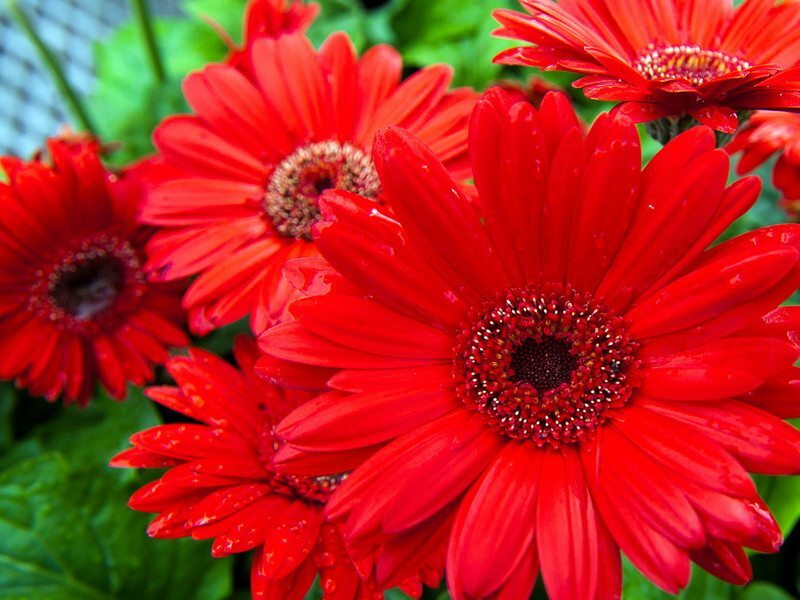 These will offer low maintenance as they don’t bloom and are extremely heat tolerant. They come in a variety of greens and yellows that will keep that tropical feel. These are actually a desert plant. The plants above are just a small sampling of what you might find to add to your pool landscaping. You can check out others in this great sample from Structure Studios in Nevada. They tell you not only some of the best, but also some of the worst that you want to avoid. They may not have the humidity we have, but they sure have the heat! Remember that whatever you decide to plant in your pool oasis, be sure to arm yourself with some knowledge and consult your local Orlando landscape supply professional for any help you may need along the way. What Do The Numbers On Fertilizer Mean? We have all wondered at some point what those 3 numbers mean on all those different fertilizers you can buy at the local garden center. We might have even known at one point, but it is easy to forget and then we find ourselves puzzled again when it’s time to maintain our lawns. It is important to know what is what when it comes to having the best Orlando sod and healthiest yards. The very first order of business when it comes to fertilizer is to test you soil. By testing your soil in various areas of your lawn, you will know what your grass will need and what numbers to look for. Let us shed some light on what these numbers mean and why they are important. The first number represented on fertilizers is representative of the Nitrogen content. Nitrogen is the most plentiful element on Earth and is essential to every single living thing. Nitrogen is responsible for making plants and grass greener and for leaf growth. When looking at that first number, remember this. Turfgrass and plants that are mostly leaves like shrubs or hedges, will need a higher amount of nitrogen. 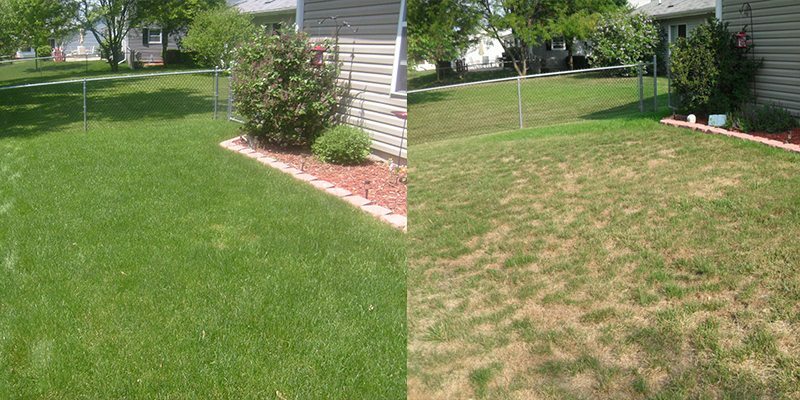 You can tell when your grass or plants are in need of nitrogen by yellowing and little to no growth. 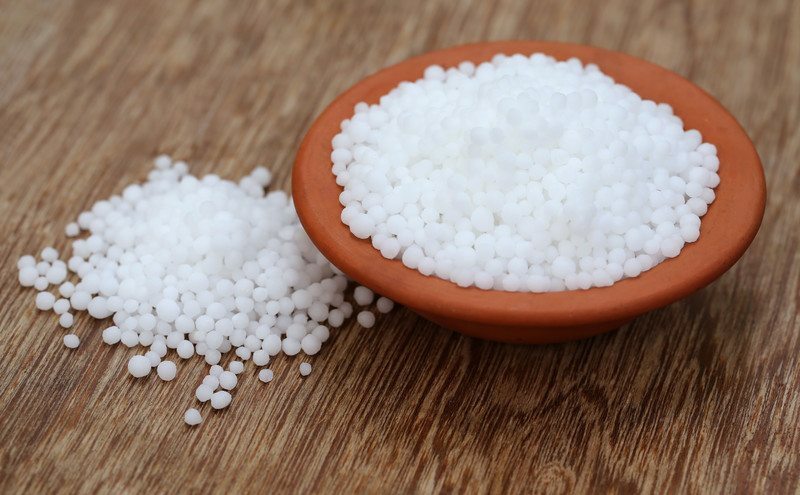 The second number that you will see on fertilizer represents the Phosphorous content. 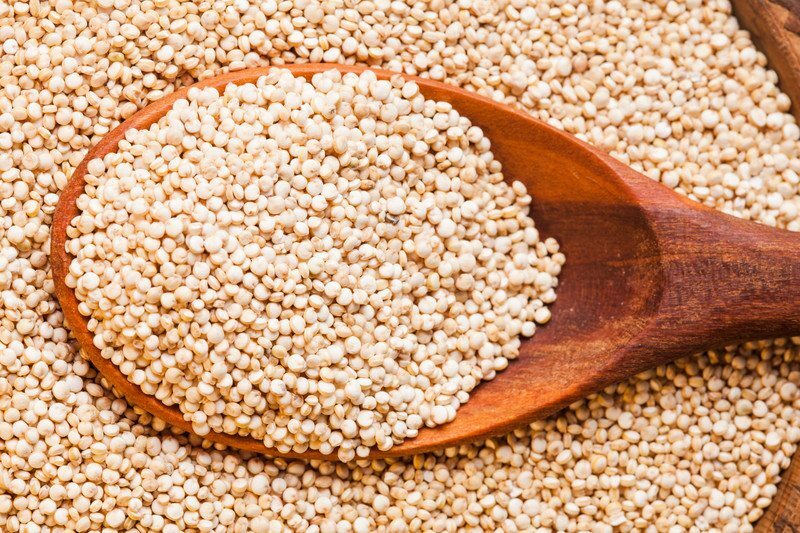 Phosphorous is also necessary for life and stimulates growth. 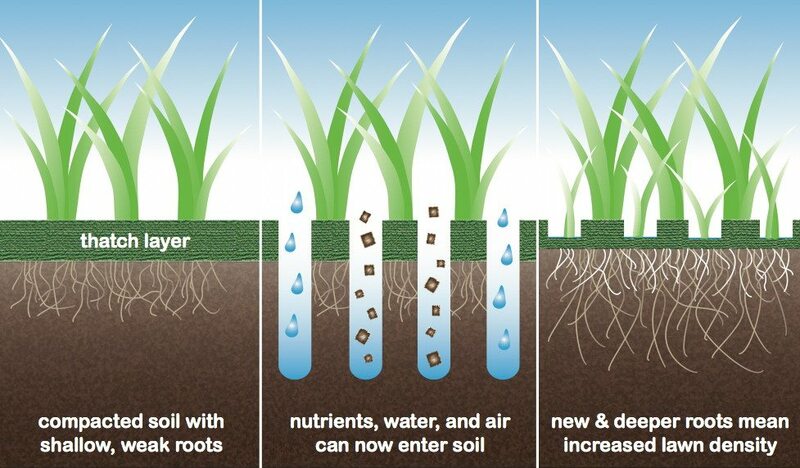 Phosphorous promotes the development of roots and will help to establish a new lawn or sod installation. It will help anchor and strengthen plants as well and will aid in growing flowers, fruits and vegetables. Phosphorous can be dangerous, however, and many areas only allow its use on new lawns. The issue is that Phosphorous run off can make it into waterways and be very detrimental to fish and wildlife as it suffocates the oxygen out of the water. Most established lawn or plant fertilizers will have a very low or zero middle number for Phosphorous. Use caution when choosing what will work best for you and your lawn and landscaping. The third number on fertilizer shows the amount of Potassium included. Of course, as you could guess, Potassium is also essential to life. In grass and plants, Potassium helps to prevent disease. 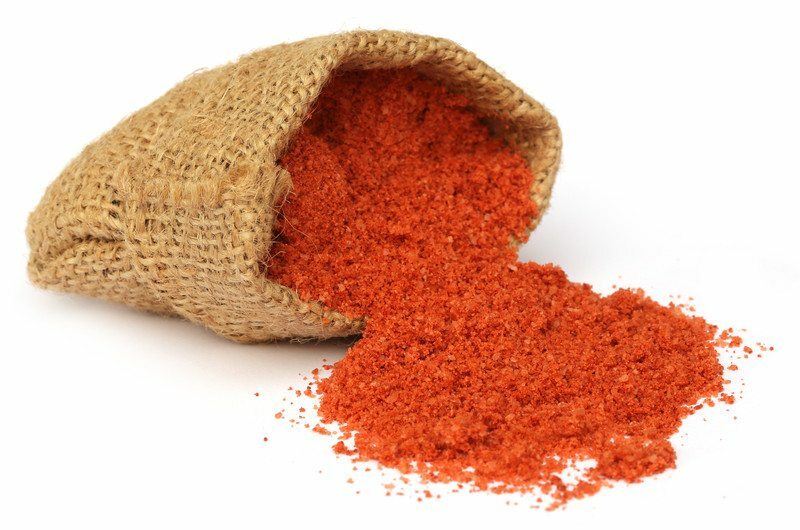 Potassium is also very important when growing fruits and vegetables so you want to be aware of this if you are looking for a fertilizer for your Spring garden. Potassium will also help your plants be robust and capable of withstanding weather during our hot Florida summers. If you see plants with weak stems or not growing very well, a lack of Potassium could be the culprit. A good standard for a good overall, all-purpose fertilizer will be equal parts, such as 10-10-10. When establishing a new lawn or for freshly laid sod, look for a higher middle number, but remember this is for short term use only. To green things up, pick a higher first number but be sure this is complementary to your soil content. For fruit, veggies or flower production choose a higher last number. To make your plants and lawn sturdy and tough to face the hot Summer or other environmental issues, look for middle and last numbers with higher values. Lastly, use caution when fertilizing. More is NOT better in this case. Chemical fertilizers can burn plants and damage soil. Less is always better and be sure to look for organic options. DIY or Lawn Treatment Service? In today’s culture, DIY is big! 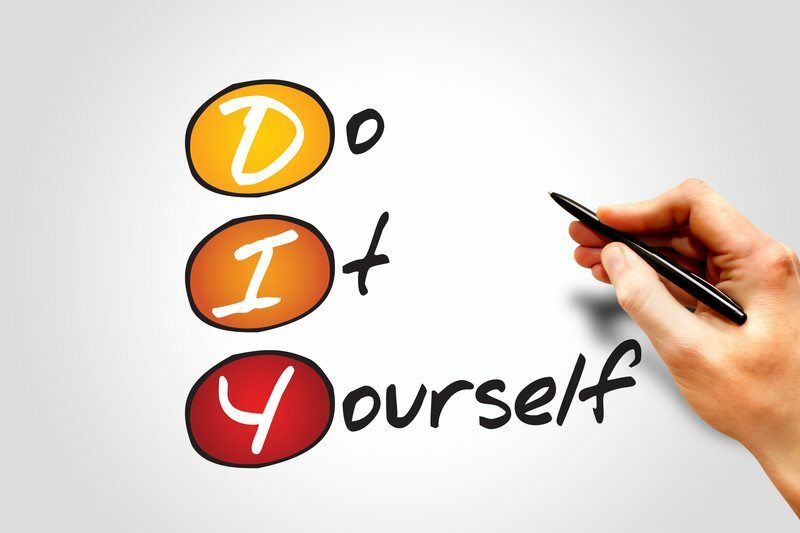 Everything from Do-It-Yourself arts and crafts, to home health remedies to home remodels can be done! The question though is: Does it always produce the best outcome or bang for your buck? Maybe sometimes but certainly not every time! We have all seen the funny pictures that circulate the internet showing “Pinterest Fails” right? If not, you can check some out for a good laugh! Seriously though, when it comes to household projects, it is best to do some pretty deep research before you decide whether to use a professional service or to Do-It-Yourself. Lawn care is no different, and likely one area that will require more thought when it comes to weighing the pros and cons of DIY or a Professional Lawn Treatment Service. 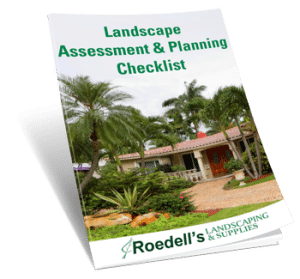 Because maintaining a healthy and attractive lawn and landscape is an ongoing, never-ending task, be sure that you consider your options carefully. Let us help you do just that. The thought of doing your own lawn care may seem easy enough when you think of mowing, trimming and weeding. That assumption, however, can be pretty misleading to many homeowners. While some people may be pretty handy or seem like they have the proverbial “green thumb”, that is not typically the majority. 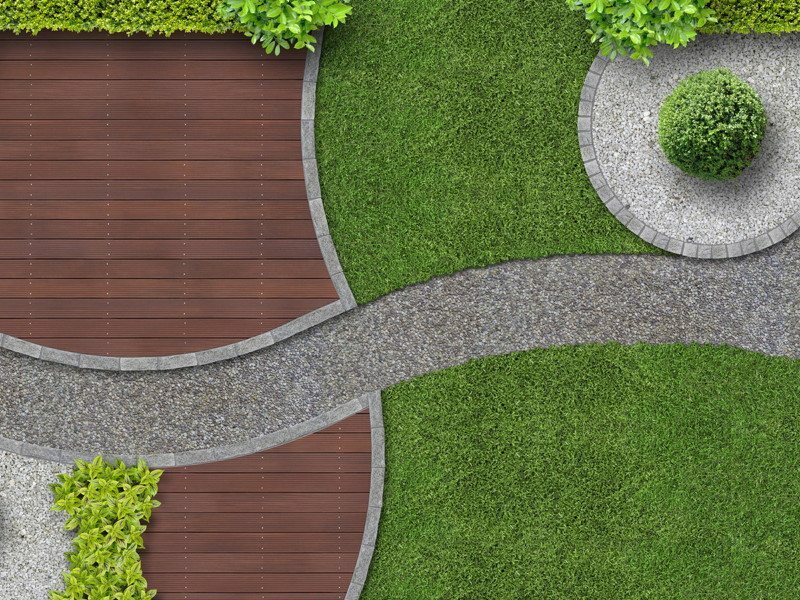 It takes more than just having a knack or good luck when it comes to making sure you have the best looking grass and landscaping in your yard. It is actually a lot of hard work and takes a tremendous amount of knowledge and know how. Doing it yourself is certainly a possible option with research and patience. Let’s think through some of the details when considering DIY or a Lawn Treatment Service. Doing it yourself can certainly reap some big rewards. For starters, it would seem to be the more economic option when it comes to lawn care. It may seem that way at first, but you may find that you end up spending more in the long run because of mishaps or uninformed choices. There is nothing worse than making a mistake and it costing you a good portion of your turfgrass or landscaping to be damaged. Secondly, yard work is great exercise and outdoor time well spent. This is definitely true when it comes to exercise because lawn care is really physical, laborious work in many cases. It is a lot more than just pushing a mower or running a trimmer. Lawn care will provide great exercise endlessly, because it is endless. Homeowners looking to do it yourself need to be sure that they are committed to the constant commitment that it takes to keep a lawn looking pristine and healthy. 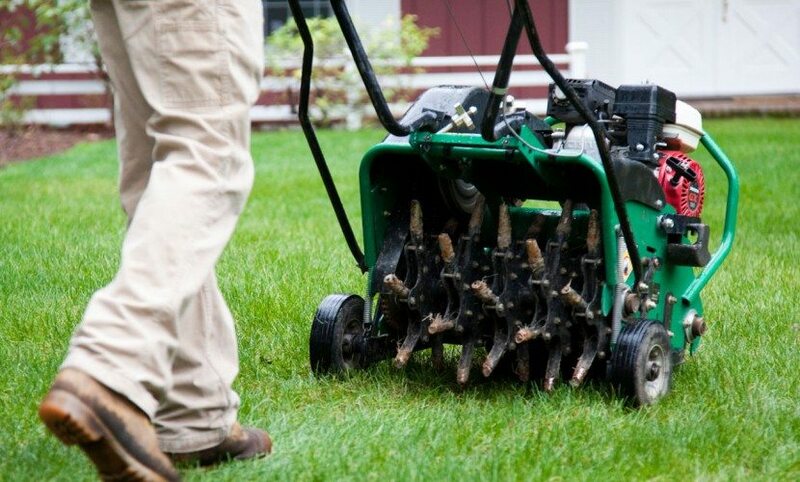 By doing it yourself, you can also have more control when it comes to your lawn care. 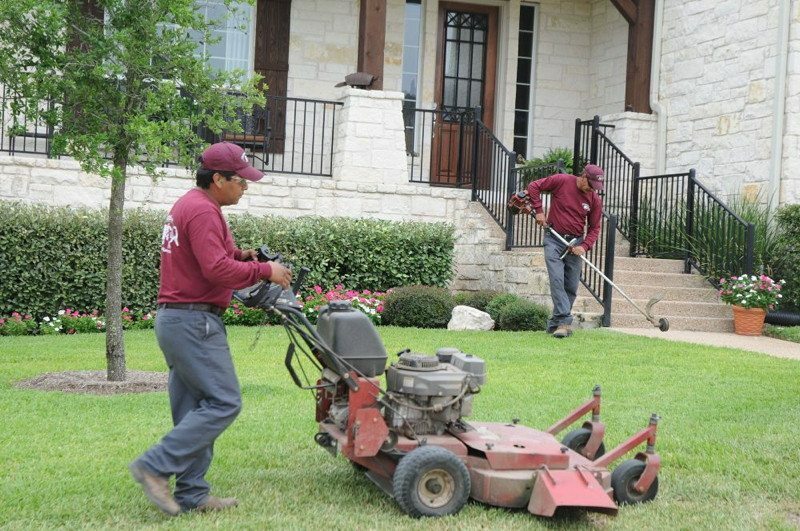 If you are meticulous about how you want things done or the frequency in which you want your areas maintained, doing it yourself will allow you to control the decisions and details that are sometimes more important to homeowners that lawn service personnel. Lastly, when doing it yourself, you can hold on to the pride that comes along with hard work and a job well done. Contributing to the overall look and feel of your home’s outdoor spaces can be very rewarding. That alone means a lot to most people. 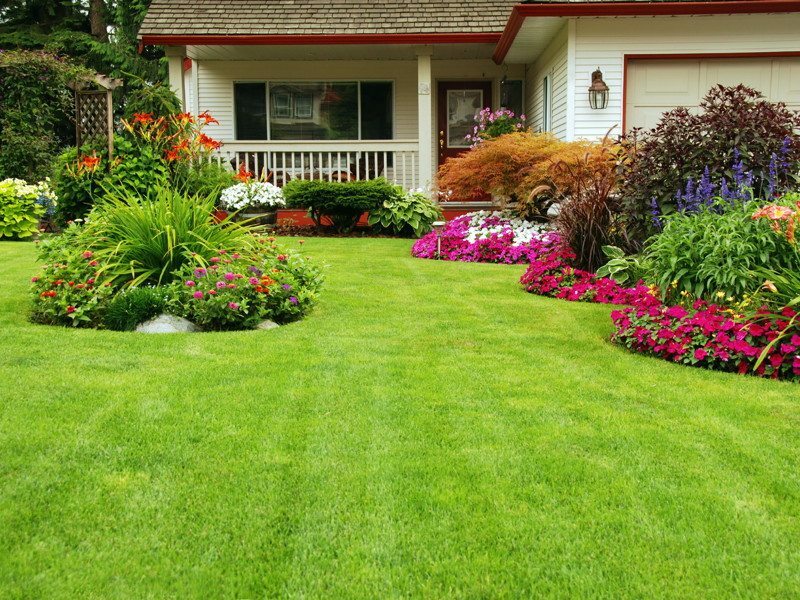 When hiring a professional lawn treatment service, it is important that you make sure to find a reputable company and one that will work within your specific needs. For this reason, we suggest you get consultations from at least 2-3 different service providers before choosing one. Be sure that they all quote you on exactly the same services you want so you can compare accordingly. If they offer extra services, have them list those prices separately. There are many benefits to having a pro do the work if you choose to do so. Professionals will have a vast knowledge of the lawn care service industry, what new products are on the market and how best to treat your lawn according to the desired outcome. Lawn treatment services will know exactly what type, how much and when to apply fertilizer to your lawn to keep it in great health all year round. Professionals also typically have heavy grade equipment and machinery that are kept constantly maintained as part of their schedule. Dull or lagging equipment can have a direct effect on your turfgrass and make it more susceptible to disease and pests. Hiring a professional will also allow for convenience as you will not have to schedule your own time for this activity and will be able to enjoy your personal time because you aren’t glued to the yard every weekend and beyond. 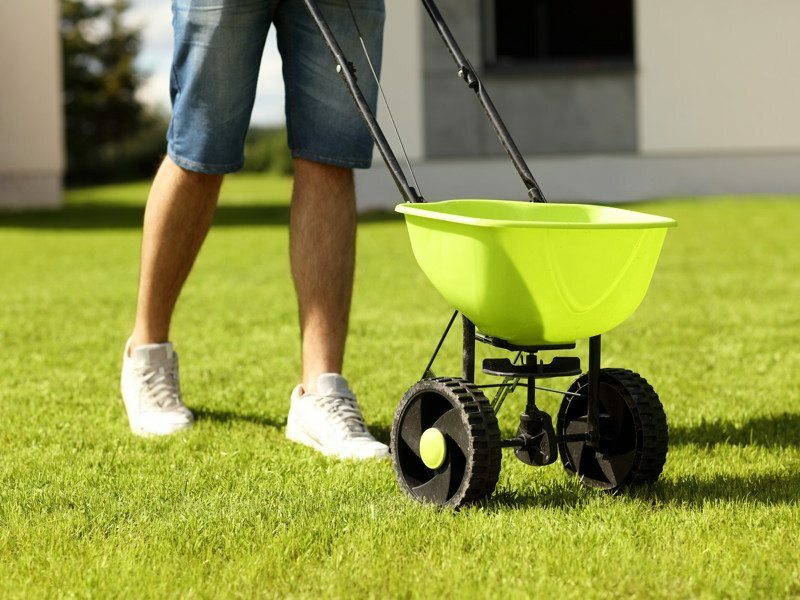 A Lawn Treatment Service will know exactly what types of fertilizer your lawn needs and when exactly to apply. This can save lots of time and frustration trying to figure it all out yourself and alleviate the risk of making mistakes and damaging your lawn. The downside of hiring a professional will be the ongoing additional cost but remember, this could actually save you money in the long run if you make any costly DIY mistakes and have to pay to fix them. The other risk when it comes to professionals is making sure you use a reputable company with proactive services. You want them to treat your yard as theirs and come to you with issues. You should never have to bring anything to their attention when it comes to issues with your turfgrass or landscaping. Their eyes should always be open. You also want to make sure that they have well-maintained equipment, the latest commercial grade products to use and skilled and knowledgeable technicians. There are a lot of guys with a truck and a lawn mower that may be cheaper but they will not be able to serve your lawn in the ways a trusted professional landscaper and lawn treatment service will. Bottom Line: Better to Use a Pro! Considering all the options and challenges when it comes to DIY or Lawn Treatment Service, we recommend using a professional. 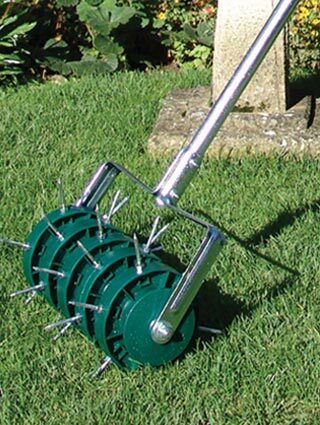 This will keep your lawn and outdoor spaces well maintained, healthy and ready to enjoy at all times. It will also allow you to kick back and enjoy those weekends! If you are weighing the pros and cons for yourself, we are happy to discuss and consult with you here at Roedell’s. Feel free to schedule a Free Consultation. Using various types of Orlando Landscaping Rock will set you apart from your neighbors and add a touch of sophistication to the design of your outdoor spaces. The addition of boulders and rocks into your landscaping can provide texture, color, depth and vertical features. Boulders and Rocks are also very versatile, low maintenance and extremely long lasting. 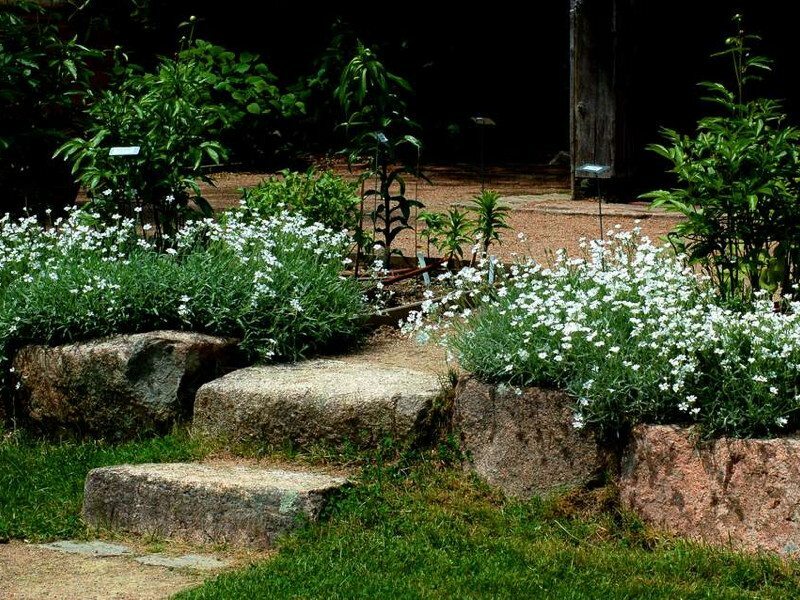 You can create a dramatic effect with large boulders as a focal point, create a creek bed, rock or zen garden, edge flower beds and even create natural seating. There are so many uses to consider, it can be confusing. Let us help guide you and offer some tips on choosing just the right size, shape and type of boulders and rocks and where and how to add them your landscaping. We hope this article will show you that a rock isn’t just a rock! First off, let’s define a Boulder! While we all probably envision a huge rock, a boulder is considered any rock larger than 16″ in diameter. By this definition, you can see that there can be many different sizes of boulders and the rocks that can compliment them in landscaping design. For this article, we will be considering boulders and larger rocks that will complement their placement. 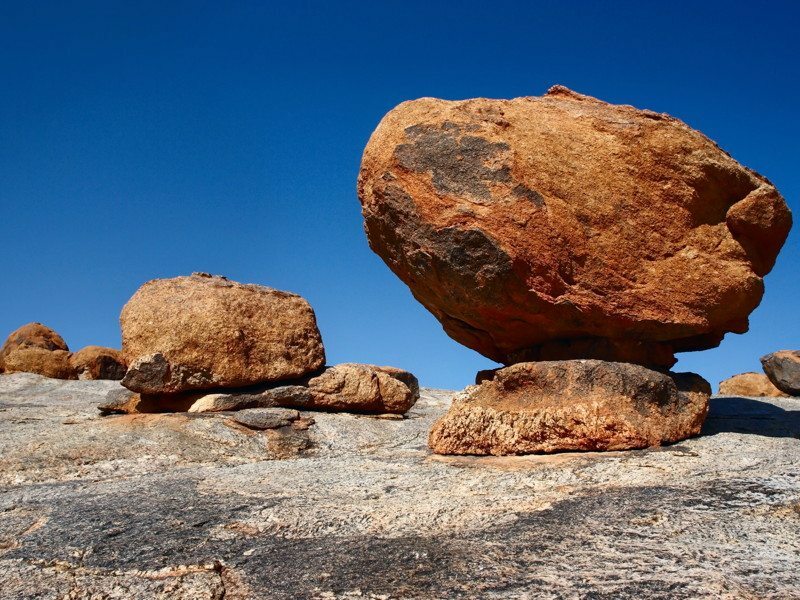 As for shape, boulders come in two basic shapes, round and angular. Round boulders will have smooth edges and will be curved from water, sand and wind wearing away their surface for likely thousands of years. Boulders also come in a wide variety of colors but that can be limited by style. The best way to start is by choosing what shape you will choose first and then review the color options for that style. Of course, you can use both shapes in your design plan! There are some more important things to consider than shape and color when selecting your boulders and rocks. These tips will help you get started when considering Landscape Rocks for your Orlando area yard. For larger landscaping tasks such as installing large boulders and rock designs, we highly recommend that you use a professional. Any boulder or larger rock designs should work with both your home’s architecture and your current landscape or new design. Use rocks that are locally sourced. They will look more natural to the area and will be less expensive than importing from out of the area. Scale is very important. Be sure to size boulders and rocks based on the immediate space to be filled as well as the overall design. A common mistake is to undersize because of the cost of delivery and installation of heavier options. 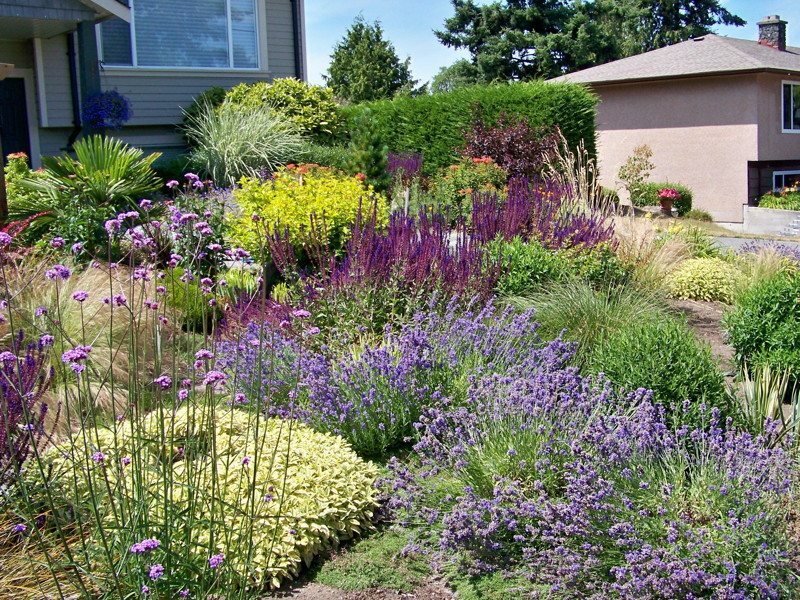 Choosing too big can also dwarf the surrounding areas landscaping features. Always arrange boulders and larger rocks in groups. You never see a lone boulder in nature. They typically exist in groups of varying shapes and sizes. Be sure to plan for installation. These super heavy investments can be damaging to surrounding areas if the installation isn’t planned correctly. Boulders are extremely heavy. A great way to mock up your design is by filling large garbage bags with newspaper and create your own light weight boulders that you can move around and design with. Use varying sizes and for larger boulders, you may have to get larger bags. It will be well worth it when you go to choose your actual rocks because you will know basic sizes and numbers of what you need without simply guessing from the visions in your head. Plan for installation. Boulders do not sit on top of the ground. They are nested into surrounding earth in nature. 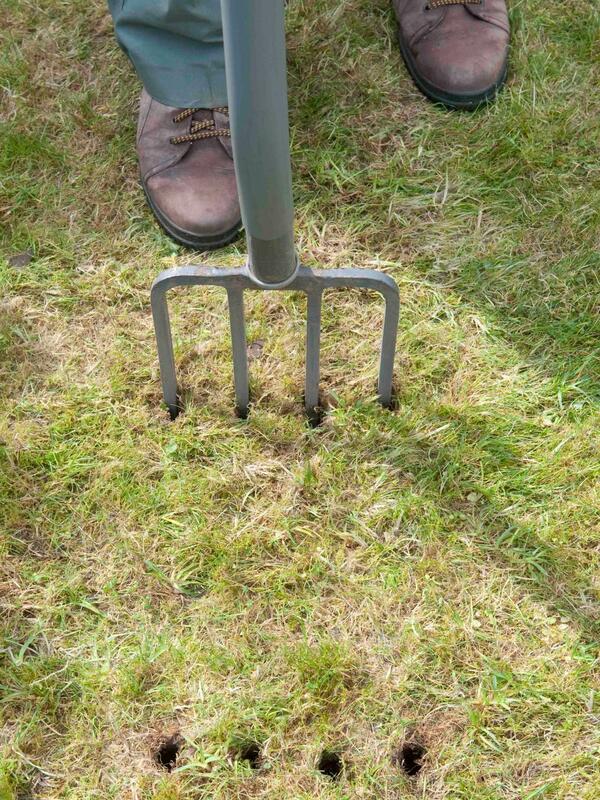 You will want to dig down and place the bottom 1/3 in the ground. This may seem wasteful, but will look most natural in your design. Plan for lifting these heavy design elements in the proper way. Consider using a forklift, or better yet a crane. Cranes allow for the operator to twist and turn the boulder so that the desired finished side is most prevalent and that you get the exact look you want. Reference Japanese Gardens and fundamentals of stone composition when considering your design. Japanese garden masters have defined the art. Seating – boulders with flat surfaces can easily serve as natural seating elements. Whether you want a place for relaxing and reading or a great place for kids to climb and play, the right rock can serve your needs. Be sure to place in a shaded area as rock absorbs heat quickly and can be extremely hot in the full sunshine. You can also use flat rocks for seating around a fire pit as well. 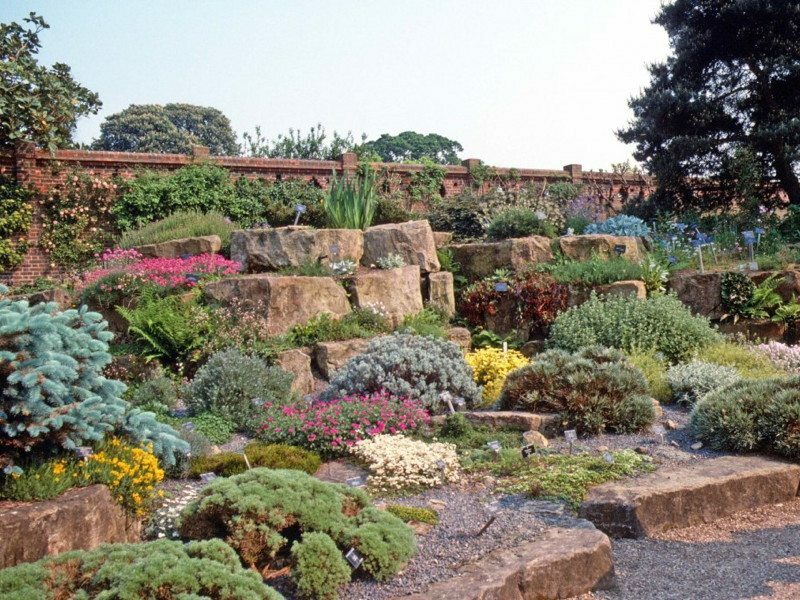 Rock Gardens are a great basis for drought tolerant or desert plants. You can create soil pockets in the places where rocks meet and around edges of boulders as in nature. This makes for a beautiful landscape design. Rock fencing and edging for your property line is an alternative to commercial fencing. You can place large boulders at the edges of your property and plant with some ornamental grasses. This is particularly effective when you want to avoid vehicles coming into your yard. Flowerbeds of all sizes can be made using large boulders and larger rocks. 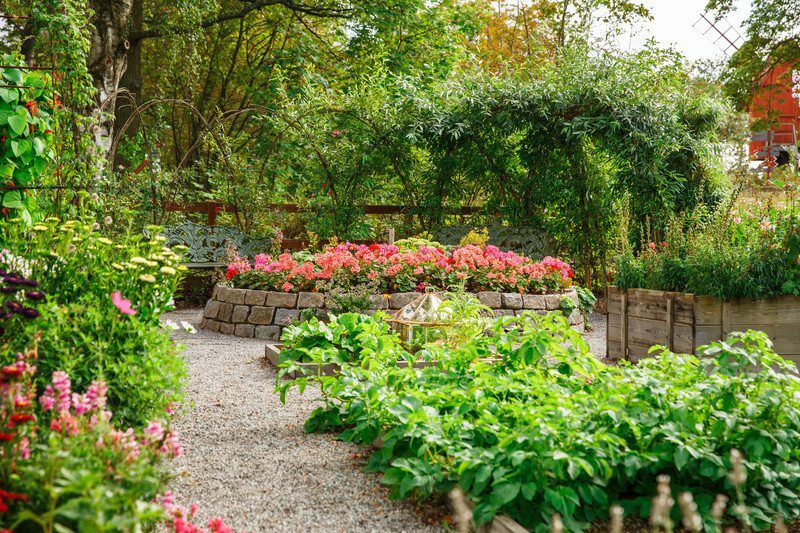 By creating a perimeter, boulders are large enough to create height to flowerbeds once filled with soil and will create a natural bench seat on the borders. Create a Zen Garden, which is different from a simple rock garden. Zen Gardens frame boulders and rocks in wood and create islands that are surrounded with sand and pebbles that are raked into wave patterns to symbolize water. Water features are well framed using boulders and large rocks. 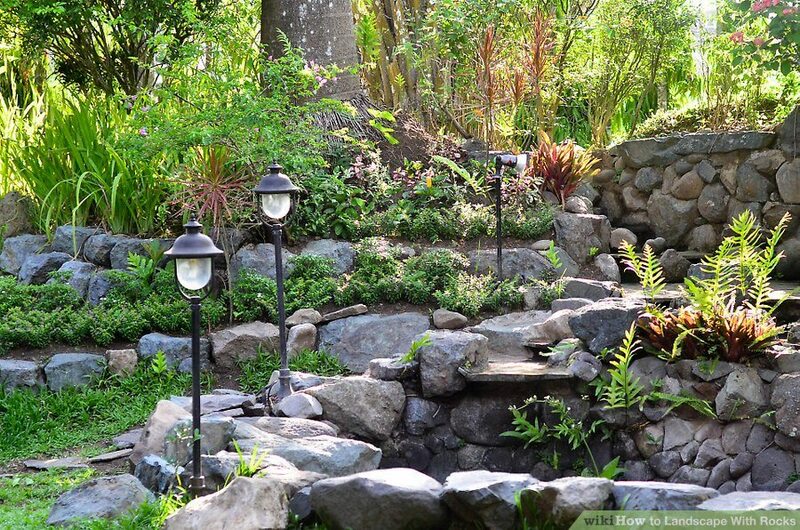 If you want the feature of running water and soothing trickles in your landscape design, consider bordering this with boulders that will also create a natural seating area where you can sit and enjoy for hours. 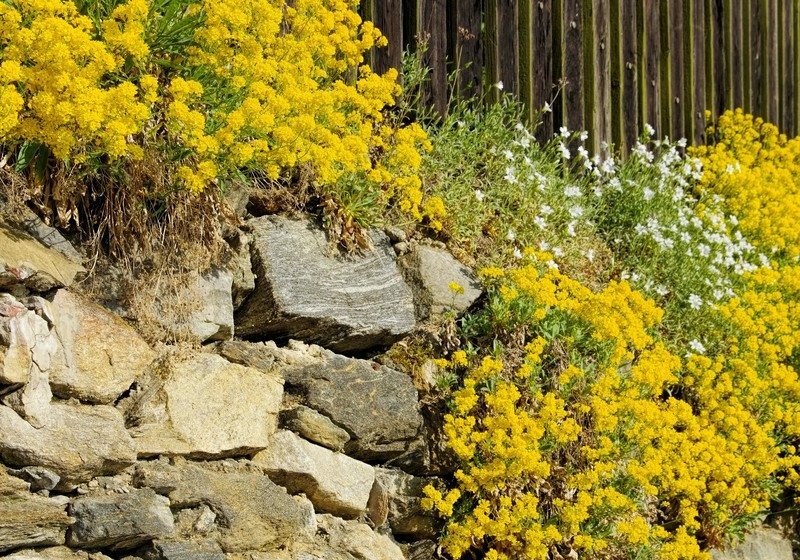 With these ideas along with our guidelines and tips, you should be off to a good start to begin using Boulders and Rocks in your landscaping design. 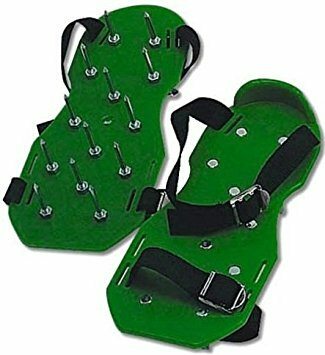 We recommend when designing with such heavy items as these that you contact your local Orlando Landscape Professional to assist you in the endeavor. You can see what types of rock we carry at Roedell’s and utilize our free material calculator by visiting our Shop page.